I am happy to say that my art will be available at the Show & Tell Pop Up at Asheville Social Hall in Downtown Asheville on Broadway St. May 10th - May 20th, 2018! Look for my art prints, AVL postcards, notecards, and magnets when you stop in!! Thank you for supporting local artists! I now have my Fine Arts Theatre postcard at Mtn Merch in Biltmore Village, and notecards and postcards at Dolce Vita in Downtown Asheville! Postcards are also available at Le Bon Café, The L.O.F.T. of Asheville, and Double D's Coffee and Desserts! I love all of these wonderful places, and I hope that you will help return the love! Shop local! Local love! Thank you to everyone who came to the Show & Tell Pop Up at Trade & Lore Coffee in Downtown Asheville on Wall St. March 15th - March 25th, 2018! Thank you for supporting local artists! 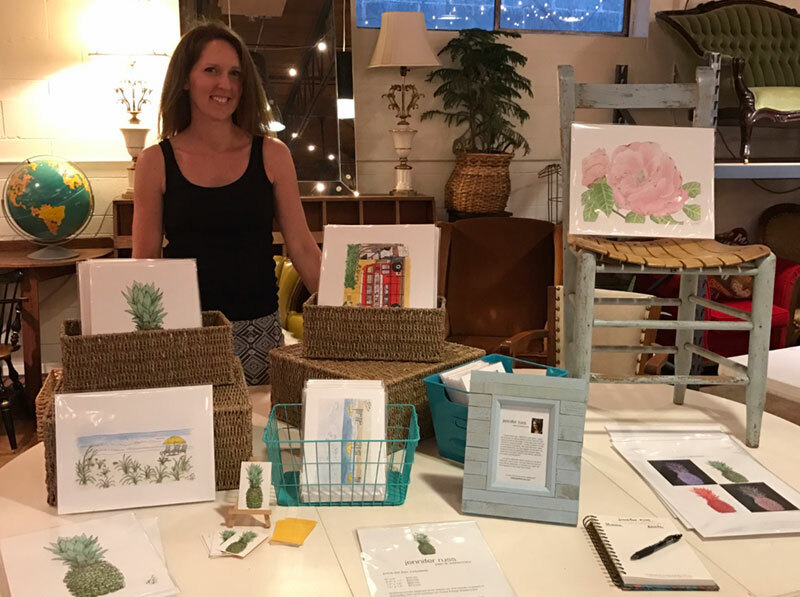 Thank you to everyone who came out to see me at the Galentines Event at Nest Boutique in Biltmore Village on February 13th, 2018 from 6-8 pm! Holiday Sale! On Thursday December 14th, 2017 from 4 - 6:30 pm, I will be at St. Paul's Preschool Christmas Bazaar at 223 Hillside St in Asheville, NC. There will be local artists and treats and all the booth proceeds go to Sleep Tight Kids, which is a non-profit organization in Asheville that provides bedtime related items to children in need. I will have my art prints, notecards, postcards, buttons, and magnets for sale. The Bazaar goes until 8 pm, so I hope you can stop by! Thank you to everyone who came out to see me at The AMS Craft Fair on Sunday! There was still snow on the ground, but you still came out to support our middle-schoolers and local artists! You are the best!! So nice to meet you and hear some great music! Thank you to all of you who came out to see me at my first event at East | West Venue! It was nice seeing familiar faces, and also wonderful making new friends. I hope you enjoy your prints! I plan on participating in an event this fall. I will post it when it is on my calendar. I have several initial sketches of new pieces that I am working on, and plan to have them ready this summer. Follow me on Instagram (@jenniferrussavl) to see the projects I am working on! !